To all the American readers out there, Happy Thanksgiving. With such a large expatriat community here in Oxford, observations of the aforementioned holiday don't diverge too drastically from previous States-bound celebration, except perhaps in that they are marginally more international in character and cuisine. Thanksgiving is one of my favourite holidays, and most definitely not because of the increasingly insane sales (which actually has relevance for the rest of this post...) or equally ridiculous amounts of food Americans consume and waste (also relevant to the rest of this post) on the day. Rather, I find that the general sentiments underlying Thanksgiving encourage reflection and gratitude instead of the materialism and excess that dominate narratives at present. But I am not procrastinating on my school work to gush about harvest festivals or how important family is this time of year. I want to talk about pie. Pumpkin, pecan, apple, chocolate cream - it doesn't matter. The division of said pie is what is important. Last week I attended the launch of a book authored by a suite of Oxford academics - Is the Planet Full? - which got me thinking. After hearing an economist, a demographer, an ecologist, a zoologist (keen on food security), and an ethicist speak, it was clear that the punchline was not a Malthusian vision of resource depletion and societal collapse. Yes, we live on a planet with finite resources and a growing human population. But these variables are overshadowed by the decisions of a minority in excessively consumptive lifestyles, and the problem we face is the entrance of a greater portion of the globe at such levels. Right now the pie is grossly unequally divided, but one of the great fears for a sustainable future is everyone demanding a big slice of pie, and thus having to borrow the pie for next year and maybe the year after to comply with all requests. In this case, unfortunately, we only have one pie available (hoping it's pumpkin...) - this blue planet we call home. 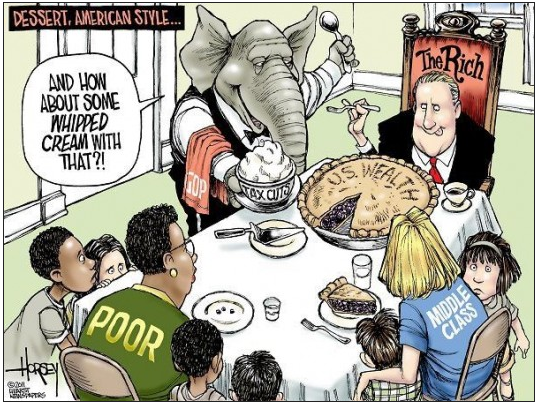 We already know that the pie is not evenly divided, that so-called "developed" nations use vastly more resources than the lower income countries. One of my earliest memories of thinking about poverty and inequality involved a spinner and a bag of rice. In the Klutz book Earth Search*, you had the option to get born again. Based on the population at the time and the proportion living in developing countries, your odds were pretty strong against ending up in America again. To reinforce the divide, the book provide a bag of rice split into two portions - born into the developing world and you can have the smaller bit that day, an industrialized nation takes it all (plus whatever else you fancy, apparently). This is a very simplistic take on global inequality, as there are a vast gaps in wealth, education, nutrition, etc. within countries of similar income classes. But this concept struck a chord with my ten-year-old self (and perhaps inadvertently shaped my path nearly two decades later). So, bringing this back to Thanksgiving, and taking this holiday as a space for a little contemplation. While there are indications of progress towards making the world a more equitable and just place, there are still vast inequalities. Thanksgiving itself has embodied some of those by being associated with consumption. I guess it's tricky as an individual, because there is little one can do to shift the structures and governance that underpin and perpetuate this state of affairs. But we can still turn current practice of Thanksgiving on its head - use it as an opportunity to be grateful for the great fortune to be where we are and practice moderation, not excess. In the end, you may just want to forget about inequality, about environmental and social injustices, and just eat some pie. Maybe it's a nice vegan pumpkin pie, but at the very least, think about the slice you're take and what of the pie is left for the rest! 2011 - Thirty Second Thursdays Snickerdoodle "Fudge"
*sorry kids, no longer in print! But check out a fun an interesting Economist article on the best places to be born.